Do Future Persons Presently Have Alternate Possible Identities? This paper argues that the nonidentity problem rests on an overly narrow conception of personal identity. The criteria for identity across possible worlds are vague and uncertain, unable to support the finely-grained judgments made in debating whether an action would harm future people. 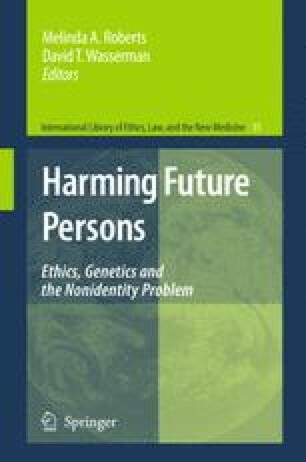 On the more plausible coarse-grained account of personal identity defended in this paper, there is no basis for denying that the very same child can be born genetically impaired or perfectly healthy. On this account of identity, the non-identity problem does not arise. Personal identity Definite descriptions Possible worlds Vagueness. Butler, S. 1910. Erewhon. Gutenberg Project. http://www.gutenberg.org/etext/1906. Accessed January 2008.